RBC rewards cards now have an amazing offer: from now on until August 31, you will earn extra 50% points using Apple Pay. 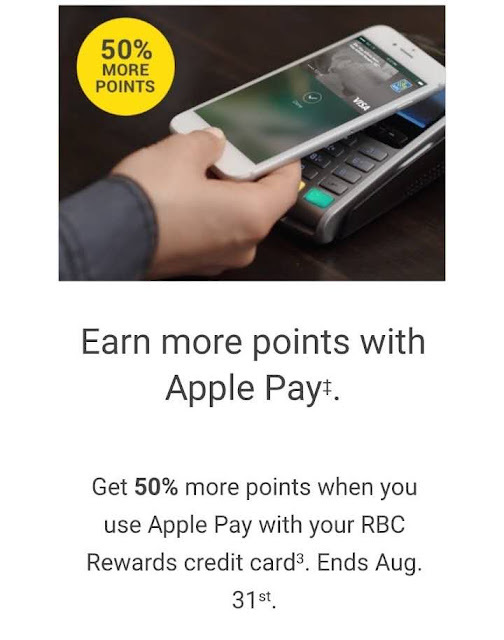 So if you have the RBC Visa Platinum/Infinite Avion you will earn 1.5 rewards points per dollar spent, and you will get 2.25 rewards points per dollar spent if you have RBC Visa Infinite Privilege Avion card. You can convert your RBC rewards points to British Airways when they have the 50% bonus promotion, and that is probably the best way to spend your RBC rewards points. No registration is needed for this promotion, simply use your qualified cards and earn bonus points.